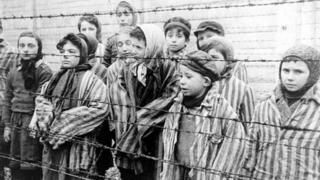 A Holocaust survivor who cheated death in eight Nazi concentration camps during World War Two has recalled his experiences, 70 years since the liberation of Auschwitz. "We arrived at 12 o'clock at night. It was dead quiet, and frightening to look at," Chaim Ferster says, remembering his first impressions of the notorious death camp. "We could see from a distance that there were flames coming out from four chimneys. I didn't realise that this was the crematorium." He had arrived in the middle of two-year ordeal, during which he endured horrific labour conditions, malnutrition and typhus, before finally being freed at the very moment he and his fellow prisoners had been rounded up to be shot, when Allied forces broke into the camp. Born into an orthodox Jewish family and raised in the Polish town Sosnowiec, Mr Ferster was 17 when war broke out in 1939. The great-grandfather remembers the rising fears of Jewish communities, as news of the German military expansion began to filter through. Now aged 93 and living in Cheetham Hill, Manchester, where he settled in 1946, he said: "You could see planes flying over. [The Nazis] came over to Sosnowiec very fast. "I remember the Jews were very concerned. Very, very concerned about what was going to happen." Then came the rationing, widespread hunger and illness in the ghettos and, later, the transportation of thousands of Jewish families. Mr Ferster said: "We'd got ration cards, and there wasn't much food in the shops to fulfil these rations cards. "We had no medication. People were dying and life was very difficult. Then they assembled various leaders from town and they shot them, just like that." In 1943, at the age of 20, Mr Ferster was forced from his home. Amid the chaos he had avoided being taken away a year earlier, when his mother and sister disappeared, and his father, Wolf, had died of pneumonia in 1942. It was widely accepted that people picked up by the Gestapo never returned, Mr Ferster said. With this in mind, a relative urged him to learn a skill that would make him useful to the Germans, prompting him to learn to fix sewing machines, becoming classed as a "mechanic" as a result. Between 1943 and 1945 he was moved between eight different camps across Germany and Poland, enduring terrible conditions, in which many died. At one stage Mr Ferster remembers being forced to shift blocks of cement from a wagon, in freezing weather. "It was very, very cold, about minus 25 or minus 26," he said. "The soldiers started beating us and shouting and saying you're not going fast enough. A lot of them couldn't stand it. They got pneumonia. Some of them died." Towards the end of 1943, Mr Ferster fell seriously ill during an outbreak of typhus in one particular camp. Large numbers died. Once again though he managed to survive, but describes a horrific scene that remains vivid in his memory. "There were bodies lying on pallets, six one way, six the other way," he recalls. "There were many many pallets with bodies, very, very high." Eventually, Mr Ferster found himself moved to Auschwitz. He remembers the infamous shower rooms, and the prisoners who were sent there. "They put us into a block. All of us, one particular large block. Then the following morning, a selection of that block went into the shower room," he said. "We went to the shower room. It's the same shower room that other people went in and the gas came in. But we got the water that came down and we washed ourselves." Mr Ferster was one of the few who survived Auschwitz, which was eventually liberated in January 1945. But in the spring of that year, with Germany losing the war, the Nazis accelerated the programme to liquidate Jewish prisoners. As a result, Mr Ferster was among a group of prisoners who were marched across Germany to another notorious death camp - Buchenwald. It was there that Mr Ferster believes he came closest to dying. Prisoners were being summarily executed from day to day, and the very morning after he arrived Mr Ferster himself was rounded up with a group of fellow inmates, expecting a similar fate. But, just as he and the others were gathered together, the camp was liberated. "All of a sudden, the American planes were there and all the German soldiers ran away," he said. "And after half an hour or an hour, an American tank drove through the gates and the soldiers were shouting, 'You're free, you're free!'." He later discovered only two other members of his family survived the Holocaust - his sister Manya and cousin Regina. Through tears, Mr Ferster added: "I couldn't believe it. I couldn't believe it." After emigrating to England, he worked for a sewing machine repair business before later setting up a series of successful businesses. Chaim Ferster's story features in Inside Out North West, which will be broadcast at 19.30 BST on Monday 5 October.